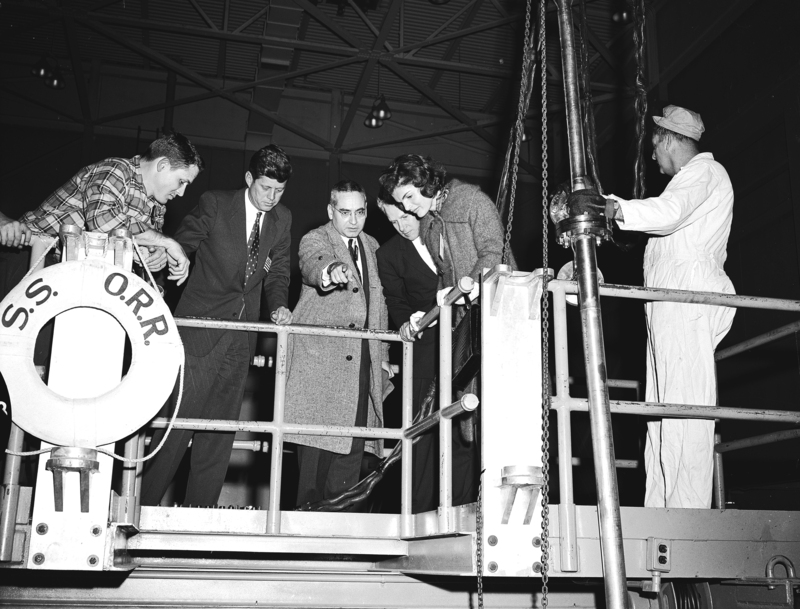 Lab director Alvin Weinberg with Massachusetts Senator John Kennedy and Jacqueline Kennedy at the Oak Ridge Research Reactor during their visit to ORNL, February 1959. Oak Ridge National Laboratory is marking three quarters of a century as a research institution in 2018. A few areas at the Department of Energy national laboratory still look like they did in 1943, particularly the Graphite Reactor Museum, where visitors can roam where physicist Enrico Fermi worked with other scientists and technicians in spartan, hastily constructed conditions, cloaked in secrecy. What may not be evident is the urgency of their task: They were racing to beat the Nazis in developing a terrible weapon based on splitting uranium atoms, which had been demonstrated -- in Germany -- a few years before World War II broke out. The Manhattan Project researchers accomplished that mission. Clinton Laboratories, or X-10, then began a rapid evolution into a research laboratory as visionaries such as Alvin Weinberg and E.O. Wollan sought to channel the power of the atom to peaceful purposes. In the decades after the war, Oak Ridge National Laboratory, as it was renamed, became a leader in developing nuclear reactor technology and applying its expertise to what was perceived as an almost unlimited slate of applications. National laboratories respond to the nation's scientific priorities and missions, which constantly evolve. ORNL evolved too. When protecting the environment became a national concern in the 1960s, ORNL responded by pioneering the field of environmental science research. When energy demand seemed destined to outstrip supply, ORNL responded by bolstering its capability in energy efficiency and renewable energy technologies. When proliferation of nuclear materials became a global concern, policymakers looked to ORNL for the expertise needed to secure those materials. Research paths sometimes took unexpected turns. Shortly after the war the laboratory was asked to work on a nuclear-powered aircraft. It never flew, but the research elevated scientific knowledge in biology, chemistry and physics and led to advances in technologies including materials, medicine, reactors, accelerators and computing. These scientific discoveries continue, and the resulting technologies continue to benefit society. Along the way, the name Oak Ridge became synonymous with atomic energy and cutting-edge science. Eugene Wigner and Clifford Shull, Wollan's neutron science colleague, received Nobel Prizes. Enrico Fermi Awards, the top Presidential award for science and technology named for ORNL's Manhattan Project pioneer, have gone to six ORNL scientists: Wigner, Weinberg, William Russell, Liane Russell, Alexander Hollaender and Sheldon Datz. More recently, when U.S. science appeared to be yielding ground to competing nations, ORNL made strategic decisions toward the establishment of state-of-the-art, basic science research facilities such as the Spallation Neutron Source. When scientific computing and computational simulation began to emerge as a critical "third leg of the research stool," the laboratory built a facility fit for the world's largest supercomputer. It's a sometimes smooth, sometimes twisted evolution of science from World War II to the present, and it can be traced at your fingertips. Take the journey at www.ornl.gov/timeline as ORNL marks 75 years of great science.